← The Sports Archives – Red Sox-Yankee Rivalry Rears Its Head! The Yankees were so eager to get rid of A.J. Burnett after last season that they picked up $20 million of the $33 million remaining on his contract so Pittsburgh would take him off their hands. Burnett’s Pirate career began inauspicious when he fouled a ball off his face early in spring training and fractured an orbital bone. Burnett missed several weeks and did not make his Pirate debut until April 21. In his third start, Burnett gave up 12 earned runs in 2 and 2/3 innings. Despite all that, it’s time to start thinking about picking up Burnett. Burnett arrived in Pittsburgh with an enormous amount of baggage from his time with the Yankees. After a decent first season in pinstripes in 2009 (13-9, 4.04 ERA, 195 strikeouts, plus a win in the World Series), Burnett was awful in 2010 (5.26 ERA, 1.51 WHIP) and 2011 (5.15 ERA, 1.43 WHIP). And it was not because he was pitching in Yankee Stadium – in both years, his road ERA was over a run higher than his home ERA). Burnett injured his hand punching a glass door during one game and showed up with a mysterious black eye in another. The Yankees were only too happy to pay millions to send Burnett, now 35, packing. Some thought that Burnett might do better away from the pressure of pitching for the Yankees. 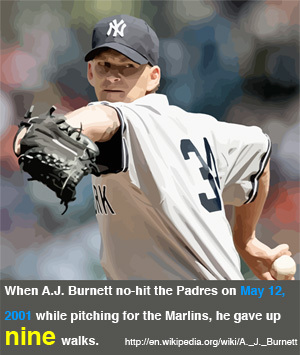 Burnett had enjoyed success previously with the Marlins and Blue Jays. When Burnett shut out the defending world champion Cardinals over seven innings in his first start for the Pirates, allowing just three hits and striking out seven, fantasy owners took notice. In his second start, Burnett allowed two runs in six innings against Atlanta, striking out eight, he began to be looked at as a potential sleeper. Then came that disastrous third start. This time, the Cardinals were ready. 12 earned runs. 12 hits. 2 2/3 innings. An ERA of 1.38 going into the game. After the game, an ERA of 8.04. So much for Burnett the sleeper. You can’t have a guy on your team who might give up 12 runs, can you? But in six starts since that debacle, Burnett has only given up a total of nine earned runs. As of June 5, his ERA is down to 3.76 and his WHIP is 1.29. Burnett has 50 strikeouts in 55 innings and only 18 walks. If you take away that one awful start, Burnett’s numbers in his other eight starts are a 1.89 ERA and 1.11 WHIP. Of course, you can’t pretend that 12-run start didn’t happen, but with Burnett’s performance since then, it’s time to at least think about giving him another chance. Ben Hargrove is a fantasy baseball expert for sites like DraftStreet, a popular fantasy sports website. This entry was posted in Baseball and tagged A. J. Burnett, Atlanta Braves, Baseball, fantasy baseball, fantasy baseball team, fantasy owners, florida marlins, New York Yankees, Pittsburgh Pirates, sports, sports and leisure, Sports Archives, St. Louis Cardinals, Toronto Blue Jays. Bookmark the permalink.